The Lee Foundation Kit is the basic element of the Lee filter holder System. This kit contains all the necessary components (including a small screwdriver) to construct a versatile holder that when assembled in its standard form, accepts three filters - 100mm (4") wide x 2mm thick. It also holds 4x6" (100 x 150mm, 2mm thick) filters. The holder can be made to accommodate up to four 2mm thick filters by using the separately-available Lee Filters 3/4" Side-Guide Screws and an additional set of Side Guides for 2mm Thick Filters. Lee makes a variety of standard and wide angle adapter rings in screw-in and bayonet sizes as well as accessory compendium shades. 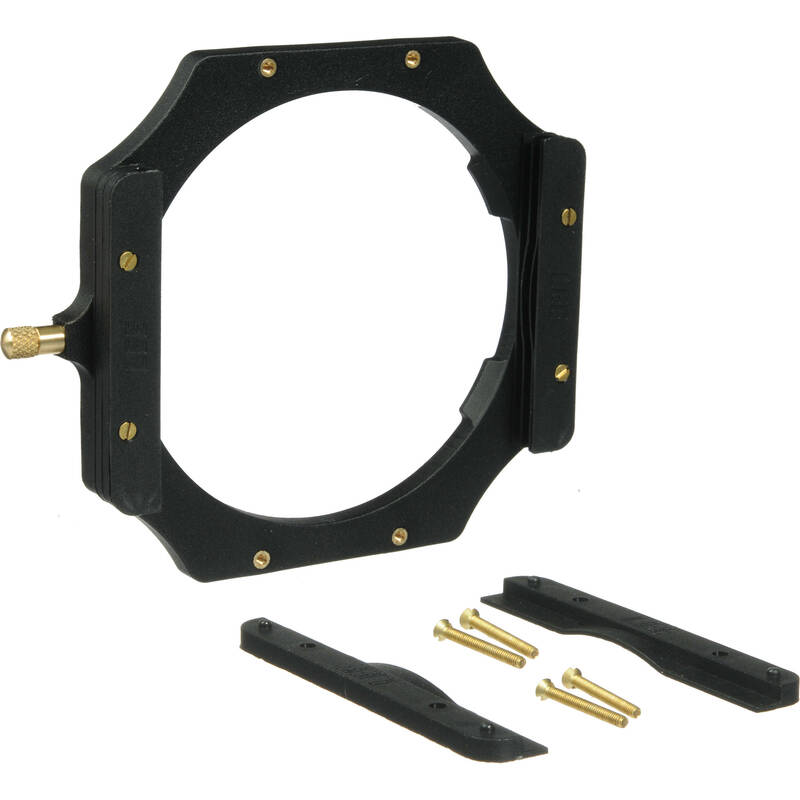 When mounted, this holder will rotate on the adapter ring for positioning a polarizer or a graduated filter. Optional "side-guides" and guide mounting screws in shorter/longer lengths are available for use with 1mm and 4mm thick filters. Box Dimensions (LxWxH) 7.2 x 5.4 x 1.3"
Foundation Kit (Standard 4x4", 4x6" Filter Holder) (Requires Adapter Ring) is rated 4.7 out of 5 by 262. Rated 5 out of 5 by Mason from The Perfect Foundation Kit I just switched over to this foundation kit from the Cokin system and I don't think I'll ever look back. First, the wide angle adaptor ring allows me to shoot at 17mm with two filters and zero vignetting. You can also tell that this system was made to accommodate the Big Stopper ND filter. I was having all kinds of light leak problems with the Cokin system, and the graded surface was eating up the protective lining. Now the filter fits plush and my light leak problems have been reduced significantly. The build is also very sturdy, ergonomically friendly, and very easy to quickly add or remove the kit in the field. Rated 5 out of 5 by Susan from well designed piece Easy to place on lenses (with adapter), easy to use. Now I do not have to hold the grad.ND filter with my hand any more (one has only so many hands). Also, I will not bump into the lens with my hand holding the filter. My only gripe is that I like to use a lenshood to reduce lens flair and now none of the hoods fit. Lee does sell this product with a detachable hood too, but it is a bit bulky with the hood and if you want to detach it (like in windy condition to reduce vibration) you would have to do it at home with good lighting, no wind and a screwdriver. So perhaps one needs two kits, one with the hood and one without. Now I just need a sherpa. Rated 5 out of 5 by Naturephotoz from Wonderfully made and works as intended I use this to hold my 4x6 singh ray filters in place when in the field. The kit comes with the ability to hold a number of filters in place at the same time so that a photographer can stack filters to add to the light control or to get even more creative when making an image. Very well constructed and does not cause vignetting on my 24 tse II, 16-35 or 24-70 lens which the Cokin P size holder and filters did cause on my full frame camera. I purchased the 77mm and 82 mm ring adapters but I have heard of people buying just the 82mm adapter and then getting a step down ring to go from the 82mm adapter to the 77mm lens ring. Rated 5 out of 5 by JG from Good Product I had long used multi-exposure and HDR techniques to blend images to achieve realistic exposure, but these techniques are time-consuming and don't always work well for scenes with moving features such as clouds. I finally broke down and bought this filter holder and a 2-stop soft grad, and find that I prefer these old-fashioned tools for landscape photography. I'm glad I bought this holder instead of trying to hand-hold filters, but to each his own. The only caveat, as other reviewers have noted, is the high cost of the filter equipment, but it is well made and solves several problems. Recommended. Rated 5 out of 5 by Ken from Well made, beats the competition I use the Lee holder along with the less expensive but, quality Hitech filters. Originally I used the Z-pro holder which was good, but the Lee is superior. It sits closer to lens, therefore less vignetting on wide angle lens. It uses a spring release that is fast and is a far better system then the little plastic pins on the Z-pro. Rated 5 out of 5 by War Dog from Goodbye Cokin: Could ahve saved $1,000! I started with Cokin filters probably 25 years ago, moving from their small 'A' sized filters to their larger 'P' size filters as I added large- and medium-format cameras. My collection of Cokin filters has probably cost me $ when adapter rings, filter holders, and multiple filters in different sizes are all considered.With the LEE System I have a single system which fits all of my SLR film, DSLR cameras, medium-format, and large-format cameras. For my smaller digital camera and rangerfinder 35mm film camera I use the LEE Seven 5 System.The ability to have multiple filters--and at oblique angles to each other--is a great tool. Have a lake or snowfield in the foreground with a range of mountains angling off? No problem, attach a filter holder to a filter holder, put one grad ND in each and you can balance out the EV's from the different areas. So much more 'photography' than doign HDR or multiple layers in a digital darkroom.I've taken some great photos of sunrises/sunsets, landscapes, and waterfalls with this system. I most heartily recommend it! Rated 5 out of 5 by John from Excellent Filter System I bought the Lee Foundation Kit along with their 77mm adaptor and a couple of filters for my Nikon Lens. In the past I've used a 10 stop screw on filter and found that taking the filter on and off to focus for long exposures was time consuming and the risk of dropping the filter was high. I bought the Lee system due to what I've read on line and I have not been disappointed. Now with the filter holder in place it is a simple task to remove the kit and filters to re-compose and focus. It's well designed and seems to be strong. I really like this product a lot!! Rated 5 out of 5 by BChase from The Professional's Choice The Lee 4x4 filter holder kit is hands-down the best filter system available. The build quality is significantly better than the Cokin P-mount system which is one of the dominant filter holders out there. 4x4 and 4x6 filters fit this holder, the larger size allows for less possibility of vignetting on wider lenses. Large & Medium Format users should seriously consider this system. Buy this and you will not be disappointed. I have a 62mm lens, so I need a 62mm wide angle ring to go with this foundation kit? Can you able to send me the link to purchase for this ring? Tks. i want to have foundation kit a LEE ND 0.6 soft grad and couple of adopter rings will these comes with a pouch? or do i need to buy a separate pouch to fit in all these items? The LEE Filters Foundation kit comes with a storage pouch. Has the basic filter holder been redesigned recently? I have an old version that is all plastic with threaded inserts for the screws. I recently saw a Lee lens hood that had a center ring that was metal that was fused to the plastic. Is the current 2014 holder plastic -metal hybrid or all plastic? This filter holder is made of a heavy duty, high impact plastic with metal screw threads built in. Do Cokin 100mm x 150mm filters fit into the Lee holder with or without modifications? Yes, the Lee Filters Foundation Kit can hold any 4x4 or 4x6 (2mm thick) filters, including Cokin. I have not experienced any vignetting. The lens I used it with was the 18 x 105 kit lens. hi im buyng from bh a zeiss 21mmf2.8 lens and id like to know if the fkit+adp.ring wa82+adp.ring+105mm polar filter will do vignetting on a full frame cmera. You may get vignetting with the addition of the 105mm Polarizer on the Foundation holder. If the 82mm wide angle ring and Foundation holder where used alone, the likelihood that it would vignette would be less. What is the largest lens diameter this filter holder can hold? Can the filter holder support lenses with diameter 52mm as well as 105mm. Is there a adapter ring available for 105mm? Both the LEE Filters Adapter Ring - 52mm, B&amp;H # LEAR52, and the LEE Filters Adapter Ring - 105mm - for Long Lenses, B&amp;H # LEAR105, may be used with the LEE Filters Foundation Kit (Standard 4x4 , 4x6 Filter Holder) (Requires Adapter Ring).